All Porsche 911s are turbocharged now right? So that must be the end of the line for the classic Porsche Turbo name? Wrong. Porsche’s fully blown range may now carry a ‘charger in (almost) every engine bay but the iconic Turbo isn’t going anywhere yet. It’s back, and with a 20bhp boost it’s back with a vengeance. 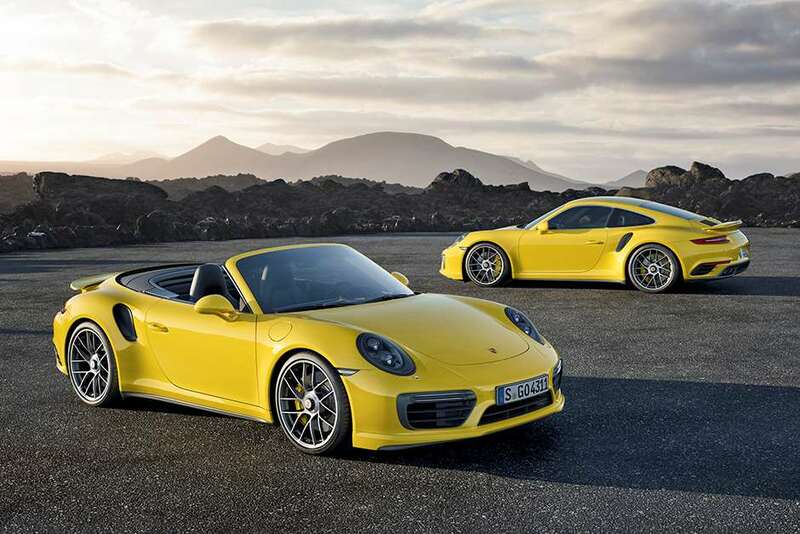 Coupe and Convertible versions of the latest 911 Turbo will launch at January’s Detroit Motor Show in both standard ‘Turbo’ and hot ‘Turbo S’ guise, and are on sale now from £126,925 for the Turbo Coupe, rising to £154,614 for the S Cabriolet – both carry the latest version of Porsche’s 3.8-litre straight-six motor. Power is up to 560bhp (580 in the S) courtesy of a pair of new turbochargers, fitted with larger compressors for more boost. For a little extra oomph Porsche have fitted a “dynamic boost function” – a system designed to keep the pressure high even when the accelerator peddle is not pressed, reducing the dreaded lag. That means the Turbo S Coupe will now obliterate the sprint to 62mph in a hypercar-troubling 2.9 seconds (the Turbo will catch up a barely noticeable 0.1 seconds later) before racing on to 205mph (186mph for the Turbo). Astonishingly Porsche says that despite the increase in power the new 911 Turbo is actually more fuel-efficient than its predecessor – managing 31mpg in coupe form. Inside all Turbo models now come as standard with the 360mm GT sport steering wheel found in the 918 and the same wheel-mounted mode button found on all 911s – now fitted with a central button that turns everything up to 11 for 20 seconds (a bit like an IndyCar push-to-pass button). Keeping you in check is Porsche’s PSM safety system and PASM dampers, which should soak up the bumpier roads without rattling your fillings. Outside you’ll find the usual Turbo trinkets, more aggressive arches, giant air intake in front of the rear wheels and a reworked engine cover.